Our commitment to safety, health and the environment is constant and unwavering. Durus prides itself on regular safety training to keep up with new codes and procedures in this constantly changing industry. 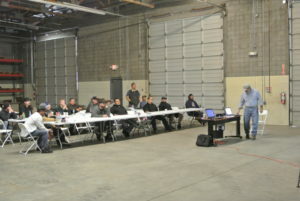 Safety Manager, Ron Hansen conducts a safety class for a group in the Durus Workshop. We utilize MSHA and OSHA rules along with Best Practice measures to insure the Safety of our employees and subcontractors as well as protecting our customers. Our Safety Program meets or exceeds MHSA and OSHA standards and we strive to improve our training and practices each and every day. We have logged over 50,000 Man-Hours without an accident and are still counting!